For the longest time I've been meaning to try out the new Byron Burger that opened in Camberley. 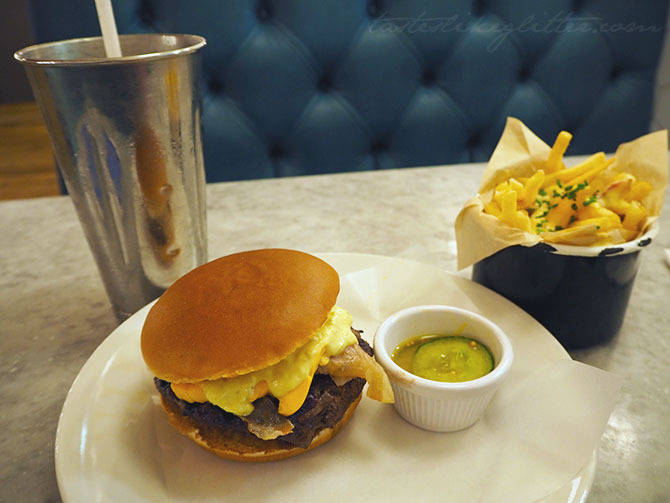 I can never pass up the opportunity of a good burger, if ever I'm eating out it's always my failsafe option. 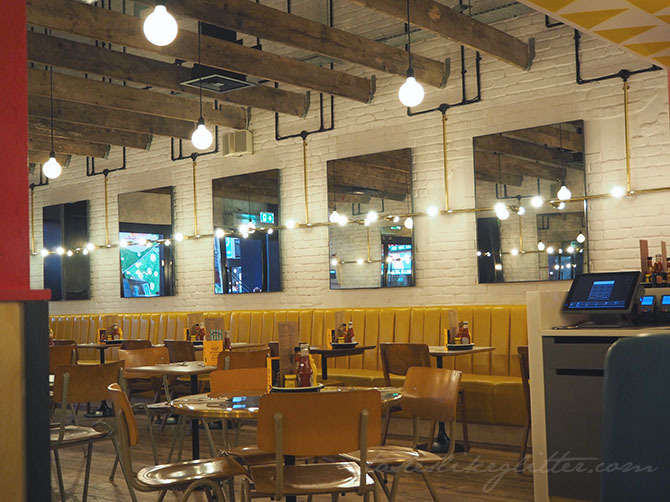 Whilst Byron has a menu that's pretty much set in stone, every couple of months they showcase a special burger that's only around for a short while. 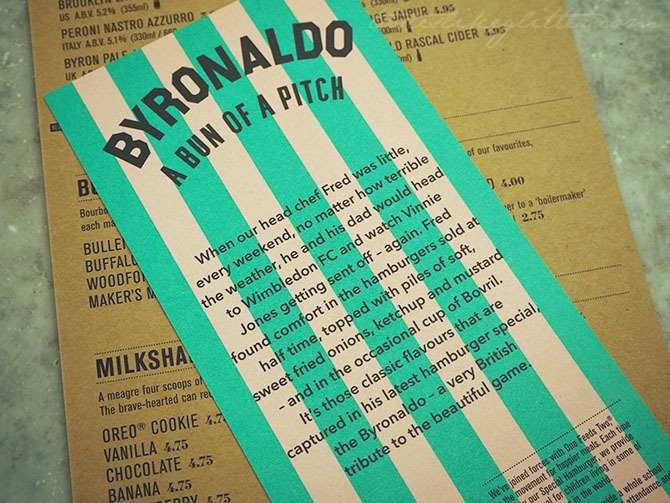 Tuesday saw the release of the Byronaldo so what better time to try it? Upon entering the restaurant I was quickly given the choice of where I'd like to sit. I opted for a corner booth right next to the kitchen. For midday it was surprisingly quiet but there were people getting takeaway burgers on their lunch break and upon leaving, it had seen more than a few people decide to sit in and enjoy their burger. Once inside it's very easy to forget that the location is inside a busy shopping centre. 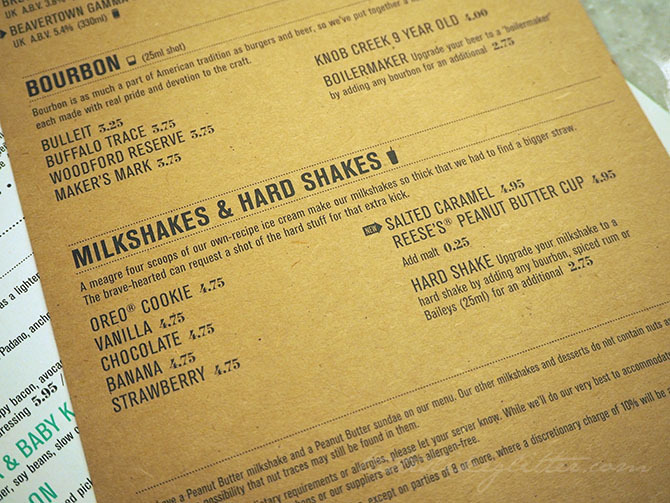 When the last special was released - The Bunzilla, Byron featured a brand new milkshake flavoured with Reese's Peanut Butter Cups. Thankfully it was so popular they've decided to keep it on the current menu. Though with this special they added a salted caramel shake. 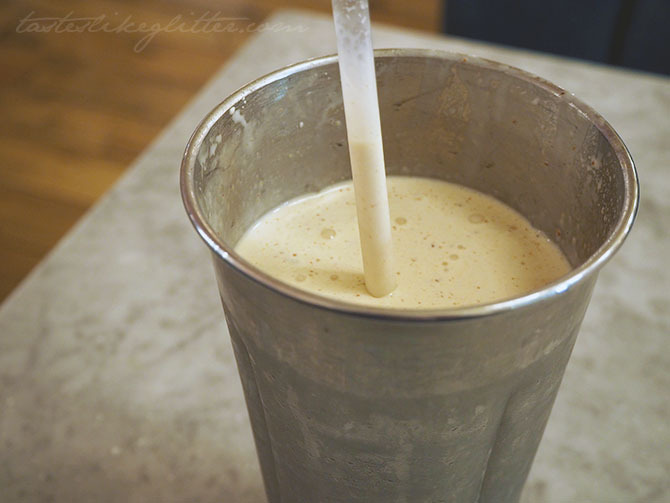 Peanut butter and chocolate is a shake flavour I just can't resist. It was deliciously thick, full of peanut buttery goodness without being overly sweet. With just the right amount of saltiness. It contained pretty decent sized cup pieces, with a whole load of them at the bottom for when you finish up. Another new addition to the menu was the bacon cheese topped fries. A generous portion of fries loaded with their very own Freddar cheese sauce and crispy pieces of bacon. The fries were cooked to perfection making for a crispy outer coating with a light fluffy inside. Byron's head chef Fred made his take on American cheese mixing Gran Padano, mature cheddar and Red Leicester, which he then called Freddar cheese. 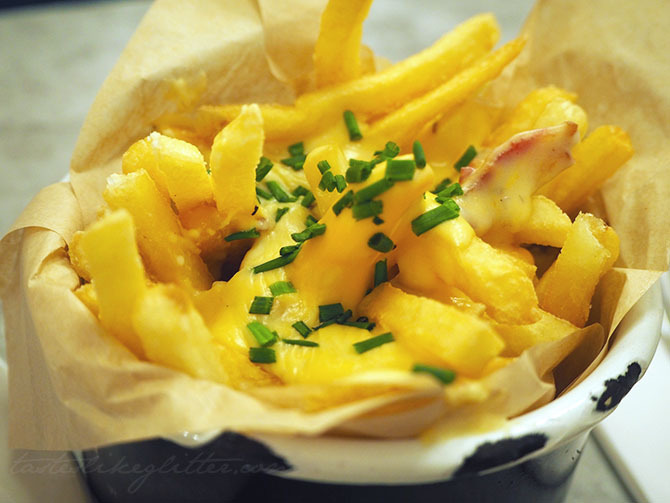 The overall flavour is creamy with a slight hint of mature cheese, without being overly salty. Mixed with pieces of crispy bacon it's a match made in comfort food heaven. I could see myself wanting to eat this on those cold days where all you want is a bucket load of cheesy carbs. And of course we save the best until last. Byronaldo. We have a 6oz burger that is cooked to their standard medium level. The server informed me this would be slightly pink in the middle and I noticed she did this to everyone. As someone who very rarely eats red meat, the sight of pink meat can be slightly disconcerting. It's then topped with crispy bacon, Freddar cheese, Bovril onions, crispy onions, bread and butter pickles and Byron's very own mustard the sauce. The sauce reminds me of the special Big Mac sauce somewhat, only better since it's loaded with that sharp pickle flavour. The onions cooked in Bovril is something I'd never heard of before but it adds a depth of rich sweetness. Whilst the pickles cut through it with a tangy sharpness. 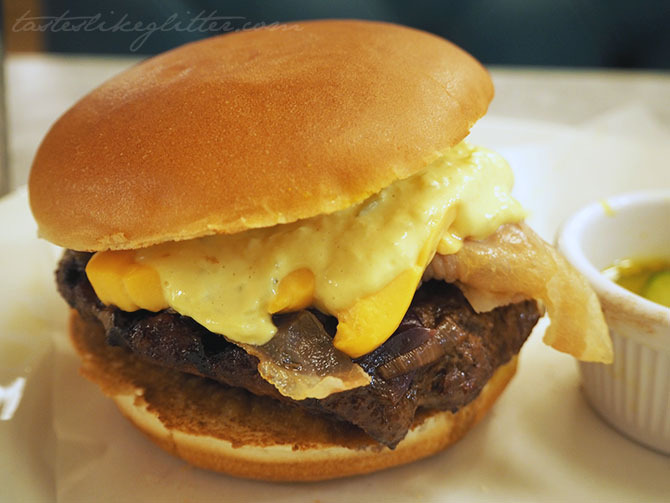 Overall a highly comforting burger. For a little over £20 it is on the pricer side for lunch out but I really do think it's worth the money. The service along with the food is worth every penny. It filled me up for the rest of the day but without making me so full I felt sick. 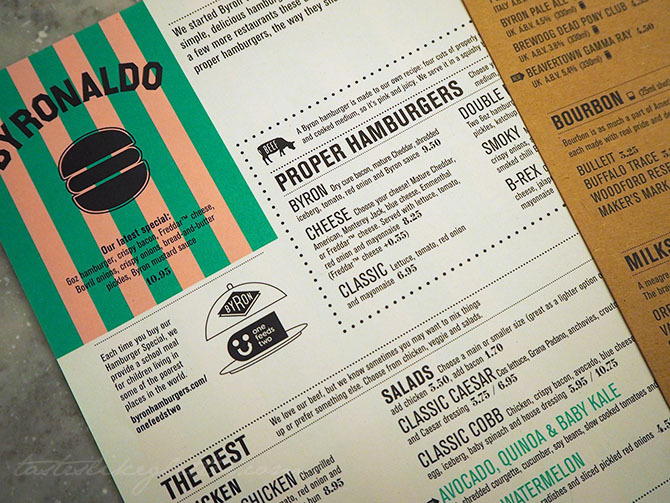 If you're looking for a new burger joint to check out I really recommend Byron. They're all over London and there's more locations opening up around the UK.